The Civil War is being played in Oregon today and you should be watching. 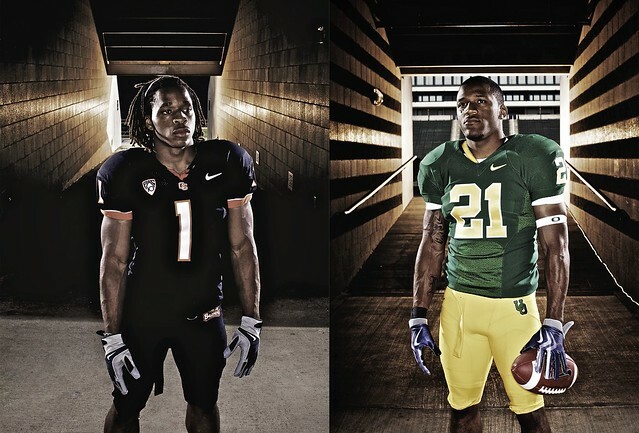 This game will feature two of the most electric running backs in college football. I won't even get into their spectacular first names but they should be recognized for awesomeness on the field. In the opposite backfield we find the French running back LaMichael James. James must be one of the faster backs you'll see on the college football field today and with the rate that the Ducks run plays it's not surprising that a few times a game he just runs right by everyone on the field which explains his career 6.7 yard per touch average. According to his immaculately sourced wikipedia page he ran a 10.5 100 meters in high school. LaMichael is currently the 4th leading rusher in the country behind 2 FCS guys and a QB. He is also 2nd in the country with 19 rushing TDs. If you are interested in seeing how he scored some of those touchdowns, I'd like to suggest the video below. No matter who you are pulling for you this is a matchup you should be watching if you like fantastic running backs. These guys are both sure to put on a show, but even if you are just in it for fancy first names you won't be let down. Tags: BCS, Beavers, Civil War, College Football, Ducks, Heisman, Jacquizz Rodgers, LaMichael James, National Championship, Oregon, Oregon St.
oh i'll be watching..GO DUCKS! were trying to get to the Natty.